The Auto RF Switchbox is an official method of connecting a Sega Master System or Sega Mega Drive (original model) to a television via RF standards. There are many types of official RF switch for both the Master System and the original Mega Drive (the connectors are identical between the two consoles). This variant is seen predominantly in North America and is the only switch of its type to be sold separately. 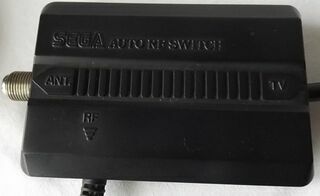 It also appears to have been bundled with consoles, although specifically which ones has yet to be determined - all Mega Drive systems between 1989 and 1993 were sold with this switch, but Master Systems were often bundled with the non-automatic MK-3092 switch instead. The Master System variant is numbered 3035, the Mega Drive's 1603, although aside from some minor cosmetic changes, the two are thought to be identical.